Deep in the heart of nearly every bluegrass musician is an “Old Home Place” desire, a longing to lyrically recreate the places where childhood memories intersect adult nostalgia. In 2015, the little cabin homes on the hill are getting fewer and farther between, and often that well beaten path on the old mountainside may have wandered through a subdivision. That is irrelevant to the feeling of home though and the emotions it brings forth. The Urban Monroes’ latest single release is one of those trips to the places of childhood and a romp through the Midwest countryside. May is almost here so what better time for an Urban Monroes update? May, being the heart of spring, means renewal and rebirth; new flower blooms, new trees blossoms, a new CD... Ah yes, Mother Nature in all her glory. New in May will be the Urban Monroes latest CD CD Appaloosa Daydream with the cut “Never My Love” going out on Poetman Records Radio Sampler that month. On Feb 8th the Urban Monroes released the single “Never My Love” making it available to DJ’s at Airplay Direct. Now, some of Urban Monroes' videos are also going to be featured on the Mountain Folk TV Show out of Pennsylvania. 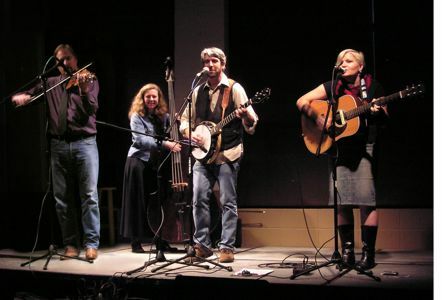 Mountain Folk has been on the air in one form or another for over 30 years. Unless you are in PA you won't be able to view it on TV but you will be able to see it on Youtube. The band is very excited about being on the show. It’s always nice to be on TV and not have to worry about stepping on the Blu-Ray player. Check the feed on the front of the band's webpage www.urbanmonroes.com to stay informed. On Feb 8th the Urban Monroes released the single “Never My Love” making it available to DJ’s at Airplay Direct. With Valentine’s Day coming, love is in the air and it does seem a timely release. Though it wasn’t originally planned to coincide with the 14th, a bluegrass love song that doesn’t end up with a murder in it is a nice touch for the heart-felt holiday. Urban Monroes will be joining Danny Barnes, Scott Law, Wayward Vessel and many other great artists as they perform at the Issaquah Salmon Days Festival just 15 minutes east of Seattle, Washington on Oct 2nd, 2011. They will be appearing on the Salmon Hatchery Stage which is located near the actual salmon hatchery grounds along the river.